We all hear this year after year: federal agencies must find ways to improve the delivery of services and reduce operating costs. It’s been a common theme over the past two decades. The drive toward these goals took center stage in the early 2000s with governmentwide initiatives designed to flush out unnecessary overlap and duplication among agencies. Results were mixed. Successes came primarily from administrative versus mission delivery processes (i.e., finance, human resources, acquisition, and payroll), mainly due to process standardization similarities among agencies. 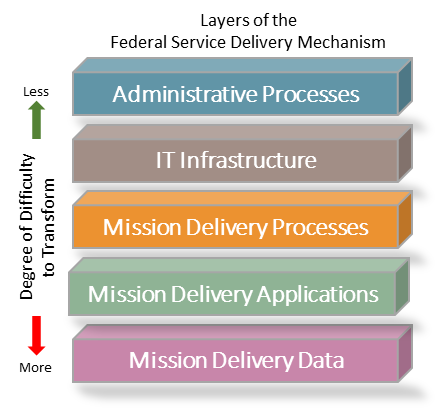 There are many fewer mission delivery success stories because these areas have been much harder to penetrate. The guidance in OMB Memorandum M-18-23, Shifting From Low-Value to High-Value Work, could change this with renewed focus on high-value work. Significant additional benefits are possible if we look beyond eliminating the low-value, unnecessary, and outdated policies and requirements referenced in the guidance and use process improvement and robotic process automation, or “RPA,” tools to improve mission delivery processes. One of the biggest obstacles to reforming services has been the struggle to change legacy mission delivery processes, which is fundamentally hampered by the time and expense of modifying legacy software applications and data stores. Only a small percentage of the federal government’s $95 billion IT budget is available for these types of development/modernization efforts and most of that goes to support legislated and policy changes and security. Yet, significant improvements will be achieved if federal staff are freed from executing the routine tasks that are embedded in these legacy processes. Consider this: federal staffing costs in 2017 were approximately $160 billion for civilian non-defense employees . Reallocating as little as 2 percent of these employees’ time—$3.2 billion worth—to value-added services could have a dramatic impact on improving service delivery. FedSmith reports that the average FY 2017 federal employee salary was approximately $81,361. $3.2 billion is the equivalent of 39,330 staff-years or 80 million hours of staff time to apply toward the increased customer service and efficiency goals. Intelligent automation, often termed “IA,” enables solving these decades-old problems now, starting with RPA, the IA gateway solution. RPA is being rapidly adopted by the private sector to improve the delivery of services and reduce operating costs. Federal agencies are taking notice because results are rapidly accumulating. For example: a commercial HR service provider reduced invoice processing time by 75% with a 60% cost savings; a lending institution reduced the time to took to analyze data and make a loan offer from 14 days to 14 minutes; and a call center reduced administrative support tasks that enabled an 83% reduction in time to provide assistance. Virtually every successful implementation frees up staff to support tasks in other areas. It is estimated that greater than 50 percent of government-to-citizen processes are paper-driven which suggests that many staff-hours to handle and process the information could be reclaimed. RPA successes come from a marriage between process streamlining and the RPA technology. Changing processes is no longer dependent upon modifying legacy systems because the RPA tools interface with existing back-office applications. This frees organizations to rapidly design and implement process improvements at a very low-cost/risk point and removes many of the former barriers to transforming the mission-delivery process-layer of the delivery mechanism. Streamlining and documenting process tasks and business rules is also a prerequisite for implementing more complex IA solutions in the future. A properly structured RPA implementation will provide the necessary on-ramp to the emerging IA technology iteration. 1. Volume (number of requests for a service or benefit). Higher volumes generate higher benefits. 2. Tasks that require a similar set of steps (data capture, data entry, analysis, decision, service or benefit provisioning). 3. Processing cadence (human and elapsed hours required to complete the tasks). BRMi recommends selecting one task or a small number of tasks within a larger process to streamline and subsequently automate as a proof-of-concept pilot project. Attempting to take on an end-to-end process is unnecessarily risky and defeats the ability to obtain quick wins which lead to ongoing support. A small RPA implementation will take only weeks to complete. Simultaneously start the process of selecting the right tool and then the authority-to-operate process, referred to as “ATO.” BRMi has partnerships with leading RPA tool suppliers. We will help you select the right tools for your long-term needs and your technical environment to avoid unnecessarily repeating these steps later. We can also leverage ATO information from other agency implementations to speed the approval process. It is essential to take time to streamline the selected tasks before automating them. BRMi has a mature, Agile-based business process management practice that rapidly reveals opportunities for streamlining. We present process and task information that is easily understood and that quantifies alternatives, including steps that are no longer needed or may be altered to meet new requirements or improve interaction with the customer. Organizations that fail to repair processes first receive limited value, if any, from their investment. Successful implementations are growing in the commercial and government sectors when they are planned and implemented properly. Deployments are measured in weeks and benefits accrue quickly. ROI is often achieved in months. The benefits from the initial small implementation are often enough to support another project. These success metrics will rapidly generate expansion activity across your organization. Uncontrolled expansion may result in chaos if not properly managed from investment, architectural, and governance perspectives. Establishing a center of excellence early on will help ensure orderly adoption across mission delivery organizations and speed proliferation of the value. This is considerably easier and more effective than having to deal with independent, unstructured implementations of multiple tools and unmet expectations. A change management plan is needed too. Employees may feel threatened that they are being replaced by robots. This is rarely the case because organizations reallocate many of their resources to strategic and customer-facing roles. A change management plan will establish processes for end-user and IT involvement, updating policies and procedures, education, and ongoing support. Incremental implementation of small projects speeds cultural adoption by demonstrating the value and impact across the organization. A centralized management function will ensure that implementations are properly planned and executed. Streamlining mission delivery processes is the next logical step in transforming government services. Agile approaches and new technologies now enable improvements that have been elusive for over 20 years in this layer of the mechanism. Changes to legacy applications and data are not required to obtain rapid value and are no longer barriers to implementing streamlining initiatives. Deployments are measured in weeks, benefits accrue quickly, ROI is often achieved in months, and benefits often support subsequent implementations. Smart planning and management of these efforts will ensure maximum value in the shortest time period. BRMi is your one-stop source for planning and executing process improvement and RPA projects in your organization. Contact us today to schedule a consultation. We’ll show you how BRMi can help you meet your streamlining goals in 2019.